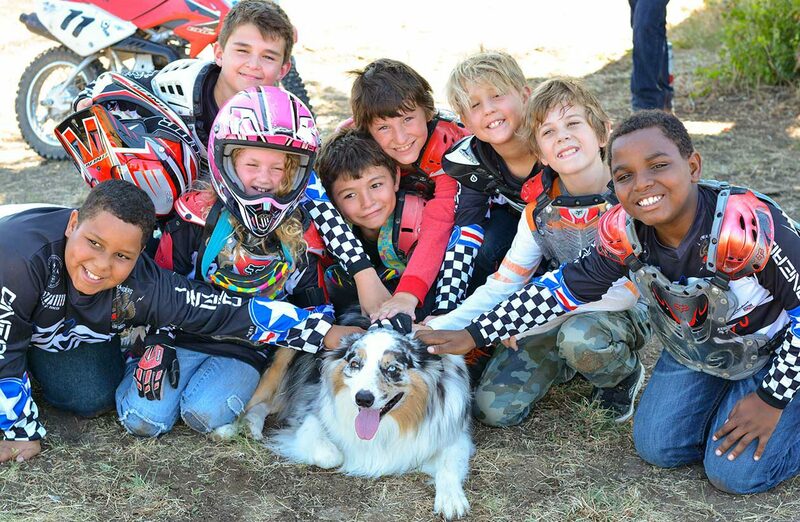 Children who attend our SPRING BREAK CAMP will have much the same experience as in the summer – a schedule designed around learning to ride dirt bikes, a Monday through Friday, 8am – 5pm week and lots of fun on our ranch. However, coming this time of year also has some built-in BONUSES to consider. Cooler Weather – temperatures average in the 60’s by morning and 70’s by afternoon, making it perfect for being outside, less chance to get tired due to heat and overall very pleasant. Smaller Group Size – Spring Break Enrollment is typically not as large as in the summer. Spring Break Camp groups are large enough to be fun but small enough to have a more intimate learning environment – a great time to try us out. More Personal Relationships with Staff – Get to know Mr. Turner and the Coaches better with the lower coach-camper ratio. Seasonal Activities – Enjoy campfires, hot chocolate, s’mores! More Ride Time! – Cooler temps can sometimes mean no swimming, which in our world means…more ride time. Spring Break Week is the only week with the flexibility to signup by the day or the whole week – another way to “get your feet wet” with being away from home at camp, trying out motorcycle riding. If you’ve been here before, it’s a way to get your “fix” of ride time when your schedule doesn’t allow for the whole week. And it’s easier on a budget just coming off of all that holiday spending. $3.00 a day for Smokey Mo’s breakfast taco stop on the way to Ranch – This is completely optional! We have a traditional stop at Smokey Mo’s in Liberty Hill before reaching Camp. WATER BOTTLE!! Refillable. Can’t emphasize enough! Full Size. WE PROVIDE THE REST! – the motorcycles & safety gear and training; unlimited snacks, water and gatorade, all-you-can-eat lunch, and recreational games – plus a great bus ride to and from Camp, using our Cedar Park High School location as the one pickup/drop off for the week. Your child will have his or her own personally assigned locker upon arrival where all belongings can be stored. After that cush bus ride and taco stop, our campers are already beginning to feel like rock stars. But man, once they see ALL THOSE RED HONDA DIRT BIKES just lined up and waiting for them, they can hardly take it anymore! Just another Spring Break day in Paradise. Welcome to our SPRING BREAK 2019 Motorcycle Camp Page! Spring Break Motorcycle Camp 2019 runs from Monday March 18th through Friday, March 22nd, 2019. Register your child for the whole week, or part of it. Make it work for you! Spring Break Camp is the only time we offer this choice. Your child will have a great time here whether it’s for the entire week or a day or two. Everything’s Included: dirt bikes, gear, training, transportation, snacks & drinks and lunch to boot! Our Spring Break Camp runs just like one of our Summer Camp Weeks – Monday through Friday, 8:00am – 5pm, with the same daily schedule of instruction, ride time, breaks, lunch and other activities. We teach beginners on up. No matter the level, everyone has fun! Registration: Click the first Link if not already registered in a 2019 Summer Camp Week. (Lunch is included, so when you get to the part of the form asking about Lunch, select the “Will bring your own” option to avoid an additional charge. Also, if new and signing up for the 2 day minimum vs. week, complete the entire form, submit and call 512-917-5733 to complete and pay the correct amount. Already registered for a Summer Camp 2019 session? – click the second Link for Payment Only.